This is the last month for the year of the cupcake. I would say I am sad, but the whole family has stopped eating cupcakes. I have an Egg Roll interlude planned before the Year of the Cheese Cake starts in Aug.
To go out with a bang I planned what I thought would be two favorites: Death by chocolate and Chocolate Raspberry. 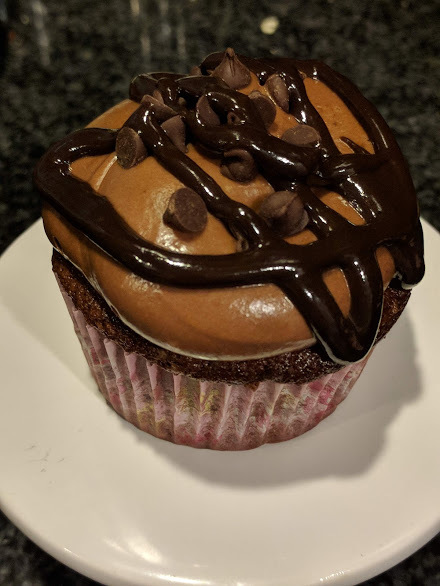 Death by Chocolate has chocolate cake, chocolate chips in the cake, chocolate cream cheese frosting, topped with chocolate chips and chocolate gauche. The chocolate raspberry is very good with chocolate cake, raspberry jam filling and raspberry cream cheese frosting. So yummy! But raspberries and chocolate are two of my favorite things. This entry was posted in Year of the Cupcake by thora. Bookmark the permalink.